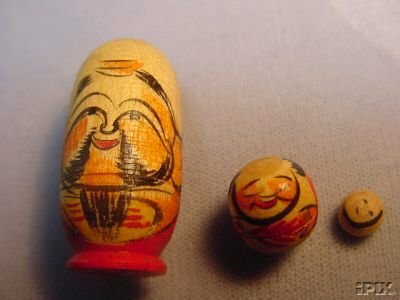 This is a miniature set of three very old nesting dolls from Japan. They are in excellent condition. The main doll measures 1 2/8". The dolls are stamped on the bottom “MADE IN OCCUPIED JAPAN” indicating that they were made in the post WWII era between 1945 and 1952.